In small businesses, team members rely and work with each other even more closely; one function could not function without its counterpart. Your team should be motivating, supporting, positive, uplifting and effective communicators. But how can one achieve this “all-star team” or perhaps strengthen it? 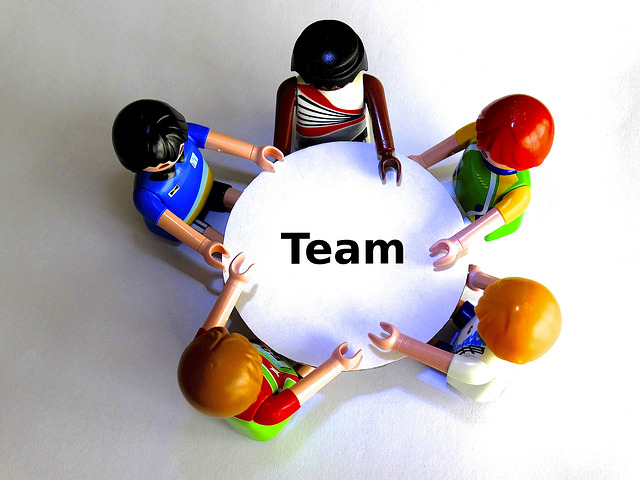 Here are some great ideas to bring “your team” to its greatest potential! Make everyone feel as if their voice matters just as much as any other employee. Hold group meetings and individual meetings (weekly or monthly) and make sure everyone has an opportunity to state their voice. As the small business owner, it’s your duty to make sure that everyone feels comfortable and valuable expressing their feelings and don’t feel “shy” or “less important” based off of their position. Also, play some games and have ice-breakers, let employees learn more about each other than just their work life! Creating an open dialogue will not only create a more cohesive team, but will also enable employees to communicate more effectively to avoid potential problems. Friday happy hour, holiday pot-luck, host a game day or a Halloween costume party! Give your employees something to look forward to! Simple day-to-day ideas like playing light music throughout the office or bringing in special treats will help create a more positive work environment. Your employees will be grateful and it will add some excitement to their daily routines! Everyone loves being recognized for their hard work, am I right?! We all sure do! Recognize big and small achievements of all employees (as a team and individually) and make it known! Additionally, offer rewards and incentives. Rewards can be as simple as a free coffee or a more flexible work schedule. Want to go bigger? Offer a team reward, such as a special luncheon, spa day or any outing! This will incentivize employees to work harder and put more pride into their work! After all, your small business would not be where it is today without the help of your team! Keep your team motivated and engaged by following some of these great tips--the results will be amazing!